On 1 August 2018, updated guidelines for prevention, detection and management of heart failure were released by the National Heart Foundation of Australia and Cardiac Society of Australia and New Zealand.1 These guidelines replace the 2011 guidelines for the prevention, detection and management of chronic heart failure in Australia.2 Here, we provide a brief overview of how GPs should diagnose, classify and manage HF. Role of plasma B-type natriuretic peptide (BNP)/N-terminal proBNP (NT ProBNP) testing. Further updates to the guidelines are included for prevention, management, devices, surgery and percutaneous procedures, and palliative care. There are 2 new sections relating to “nutraceuticals” and cardiotoxicity. The full 2018 heart failure guideline: National Heart Foundation of Australia and Cardiac Society of Australia and New Zealand: Guidelines for prevention, detection, and management of heart failure in Australia 2018. Guideline summary: National Heart Foundation of Australia and Cardiac Society of Australia and New Zealand: Guidelines for prevention, detection, and management of heart failure in Australia 2018 - Guideline Summary. Med J Aust, 2 August 2018. Atherton et al. National Heart Foundation of Australia and Cardiac Society of Australian and New Zealand: Guidelines for the prevention, detection and management of heart failure in Australia 2018. Heart and Lung Circulation 2018; 27(10): 1123-1208. National Heart Foundation of Australia and Cardiac Society of Australian and New Zealand (Chronic Heart Failure Guidelines Expert Writing Panel). Guidelines for the prevention, detection and management of heart failure in Australia: Updated October 2011. National Heart Foundation of Australia, 2011. Ponikowski et al. 2016 ESC guidelines for the diagnosis and treatment of acute and chronic heart failure. 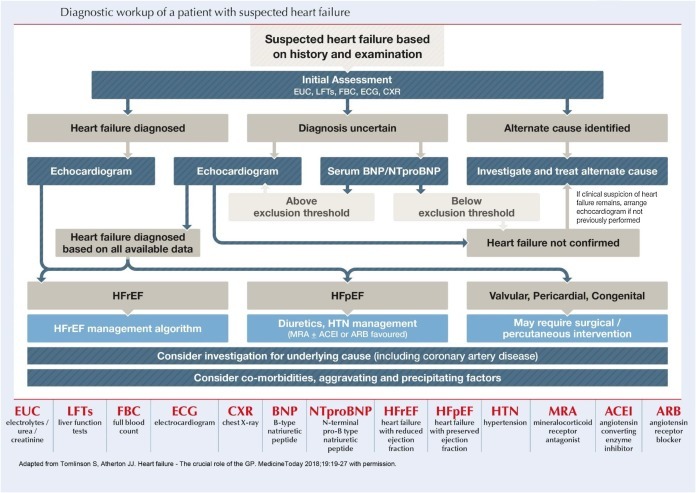 The task force for the diagnosis and treatment of acute and chronic heart failure of the European Society of Cardiology (ESC), developed with the special contribution of the Heart Failure Association of ESC. European Society of Cardiology, 2016. This guide was produced by ThinkGP, and sponsored by Novartis.